I thought today would be a good day to post a soup recipe since it happens to be raining at my house. I got this recipe from the cookbook Seriously Simple (I have done some minor tweekings). The ingredients required are refreshingly simple and basic, but the texture and flavor are anything but. This soup would be great served with some crusty bread. Preheat your oven to 425 degrees F. In a roasting pan (or pyrex like I did) combine the asparagus, leeks, olive oil, salt and pepper. Mix to combine and coat. Roast, stirring occasionally, for 35 minutes or until the leeks are golden brown and the asparagus is nice and tender. When you are finished roasting, transfer the vegetables to a blender. Add the broth (I poured all but a 1/2 cup just to make sure I could control the texture I wanted). 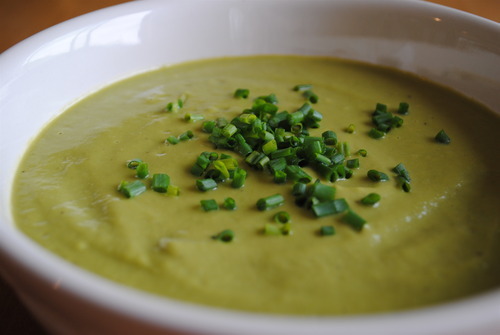 Blend on high until you have a smooth puree (I would say blend it for at least a minute). Check to see if you like the texture. I ended up adding the remaining 1/2 cup and the texture was perfectly velvety. Salt and pepper to taste.